One of the things I LOVE about doing challenges is how people inspire others. Especially in our 365 Items in 365 Days group. And this challenge was no different. Shayne shared a wonderful way to pass pictures on to family members: "During this decluttering all the pictures, I have pictures of my stepdad and his family. I was thinking for Christmas to make a album with all the pictures. All he has left is his sister and his partner. I thought it be a special memory." Sabrina shared how photobooks worked in her family: "Last year, we received a coupon to make a free photo book for each of the kids. So, instead of scrapbooking that school year, I had them make a photo book of activities for the school year. they were even able to create the cover. 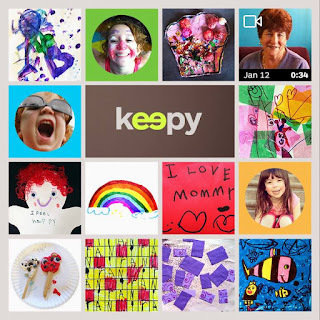 It was a great keepsake." Seana commented on organizing photos by themes vs. organizing chronologically: "The idea of organizing by themes was a huge light bulb for me a couple of years back. It never occurred to me that I could do that. Since many older photos were out of chronological order, it was also a relief. When I made albums for my girls upon their high school graduations, I did theme pages, uploading and printing photo books. It is actually very fun to look at the images this way!" Carrie shared a lovely way she is displaying special photos on her wall: "I did just that this month. A small collage of our kitty Riley who passed in December. It includes her collar, and favorite crinkle toy. 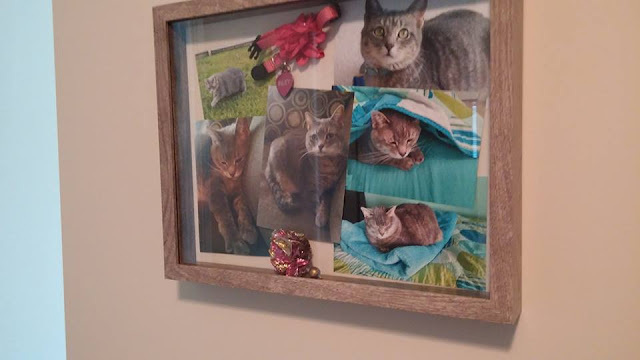 It's a shadow box and pictures are just mounted with tape. I have about 50 pictures printed, and will swap them out once a year or so." There were some struggles along the way this month and to keep it real, I wanted to share some of those too. Deanne had been doing a great job decluttering her digital photos on her phone, when one day she shared this: "Imagine my dismay when I looked at the photos on my phone and the number had ballooned by 400!!! WHAT?!? Well, my husband turned on photo sharing on icloud and when I returned home my phone sync'd and I HAD ALL HIS PHOTOS TOO!!!! Note to selves - when decluttering make sure you check all the processes that might result in your clutter coming right back at you! lesson learned (the hard way)." 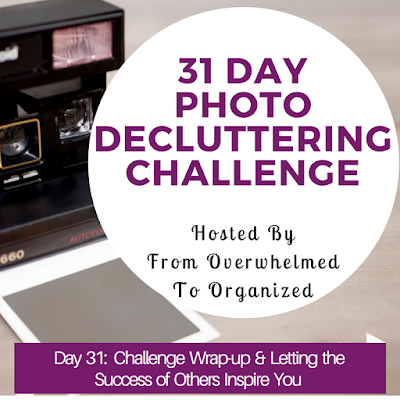 I had the same sort of thing happen... as hard as I've been working to declutter my digital pics, I realized part way through the month that I hadn't taken pics off my husband's phone before the challenge so my numbers increased instead of decreasing at that point. Plus I continued taking photos throughout the month so I felt like it kind of took away some of the progress I was making. But, I also learned this month to more aware of what photos I'm taking and to not take pics that I'm going to end up deleting later. Or if I need to take some temporary pics then I've been working hard to delete them as quickly as possible. 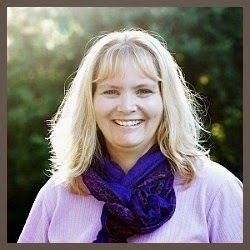 Alli's tip: "One of the things that really helped me with digital photos was creating a "to sort" folder. This way I can upload my photos all at once, even if I don't have time to sort them all right away. From here the photos either go into proper folders or they get deleted. It also makes it super easy to sort through photos in short bursts. I can quickly skim through the folder and select all the blurry ones to delete. Or select all the ones from a special occasions and move them into their own folder. No more hunting through a bunch of folders to sort my digital photos." Windy's tip: "I find I must rotate tasks.....there is my digital collection, my boxes of photos, my 37 albums from my mother-in-law (which I promised to handle for the entire family), and my phone........not to mention other albums, and stacks of envelopes full of printed photos and negatives which I never did anything with other than look at them and stick them back in the envelope. I have to rotate tasks because to soldier on through any ONE of these just bores me to death. So each time I work on photos, I tackle a one of several jobs I have sketched out for myself. I have a little stack of six index cards, telling me what I can work on. I sit down, choose one card, and get to work." Julie's tip: Start with the low-hanging fruit: "300 photos gone from computer hard drive this morning. Fuzzy pictures. All dark photos. Pictures of my hand or the ground. Screen shots that I only needed for a minute. Super easy to pick off the low hanging fruit. Next I'll have to go through and really see which pictures I just don't need to keep. That will take more time and a critical eye!" First, an update on the last day's decluttering. I deleted 399 digital pics today, which was 78% of the photos I went through. I was really surprised how many I was able to delete this time. Most were from vacations or day trips and I tend to take a lot of pictures because we're in new places and doing activities we don't usually do so I want to capture those memories. But I need to focus more on deleting all the less than great shots sooner after we come home so they don't keep accumulating. OK now for my totals for the month! I didn't spend as much time decluttering digital pictures this month as I'd hoped. Between writing a blog post every day, the time I spent decluttering printed photos, and, you know... everyday life... I did what I could. I'm very happy to report that I deleted 5,574 digital pics this month. Of course I started with over 47,000, so I still have a long way to go. But it represents about 12% of my digital collection decluttered. Initially a lot of those photos were deleted using a duplicate finder. More recently I was just going through photos from 2017 and deleting any that weren't the best of the best. When I decluttered photos that way, I deleted 70% of the pictures I went through. I'll keep plugging away at my digital pictures. Every little bit adds up! After going through all my pre-digital era photo albums, I decluttered a grand total of 1330 pictures/items, representing a total of 58%. I also decluttered 14 albums and a bunch of packages of negatives. I'm so happy to have all those albums gone and off my shelves. I'm currently storing the pictures that I decided to keep in a photo box on one of my shelves and I will be scanning them later and creating photobooks out of them. This was my main priority for this challenge and I'm proud of myself for accomplishing it! Today your task is to CELEBRATE your efforts! 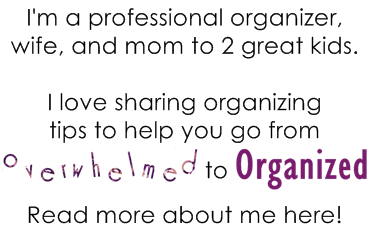 Whatever decluttering you did this month, that's progress and is worth celebrating. If you still have more photo decluttering to do (like me! ), keep at it. You'll get there. 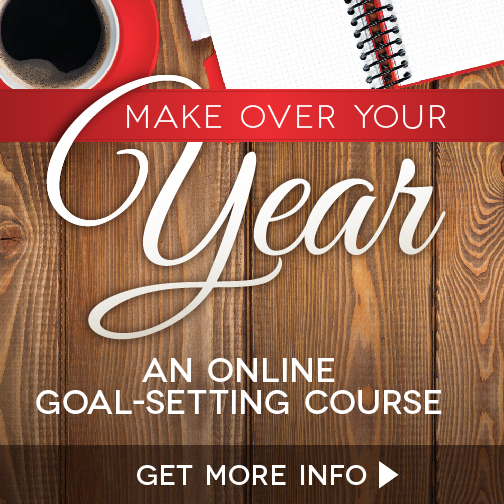 Join the 365 Items in 365 Days FB group and we'll keep cheering each other on! 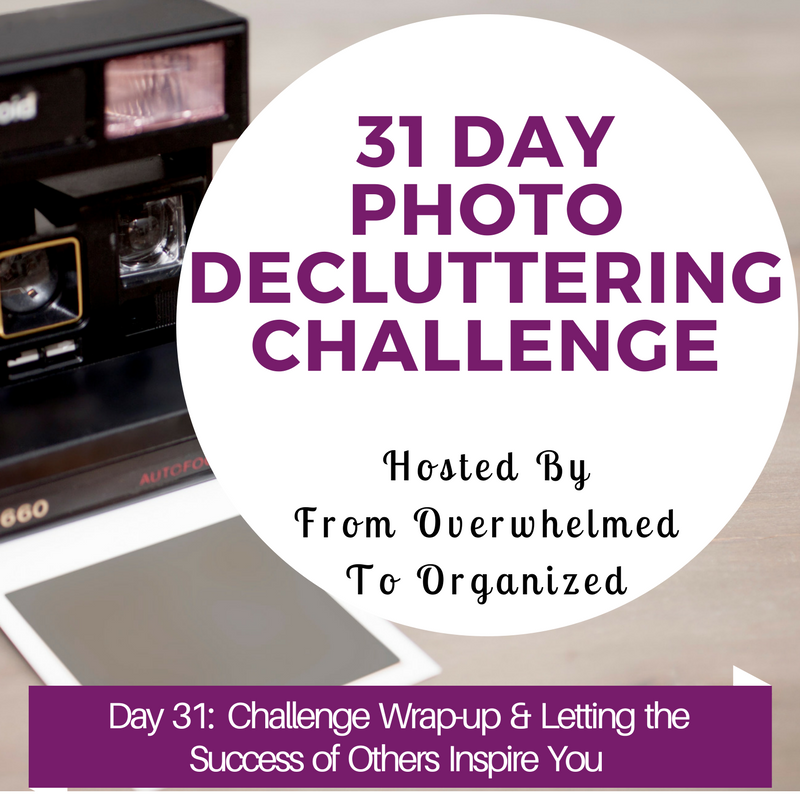 How did you do in the 31 Day Photo Decluttering Challenge? 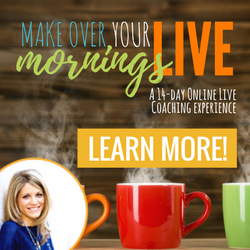 Let me know so I can celebrate your success with you!